Every tech giant in the past had a digital game to support brand’s value and showcase it’s true potential. Social networks had FarmVille, mobile games had Angry Birds. Being the next big thing, Blockchain isn’t an exception. Introducing CryptoKitties – a digital version of Pokemon card game and the first real decentralized Blockchain gaming experience. Already, more than 180,000 people have spent a crazy amount of money on it – $20 million on an ether, with some kittens being bought for more than $100,000. Sounds unreal. However, the system of this game is some kind of an international free market, where you can make money from an absolute nothing. Today, we try to understand how CryptoKitties work, why it became a thing and what would it mean for the future of both blockchain and gaming. 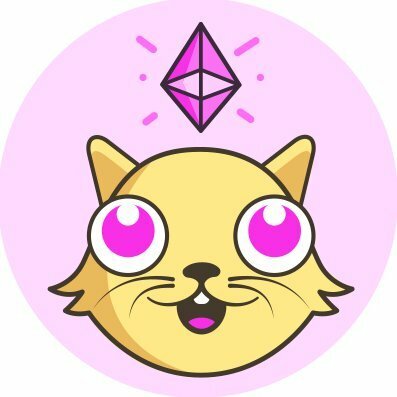 CryptoKitties is a blockchain based game that is completely powered by Ethereum, currently taking over 15% of all its transactions. You buy a kitten and either sell it straight away, hoping to get the better price or start breeding it. Simply find yourself a suitable “pair” (either by buying or leasing another cat), and create a completely unique, one of a kind kitty. The thing is that every creature has its own GA (Genetic Algorithm), similar to real biological genetics. In CryptoKitties they alter various features of your cat – fur patterns, color, stripes, etc. This way a newly born kitten will get characteristics of both of his parents. This feature makes crypto collectibles, way more progressive and exciting than a regular collectibles game – creating new breeds, while being emotionally attached to them – win-win situation. It is like creating your own Pokemon card that no one can steal, hack or destroy – on Blockchain it is yours forever. The most exciting part for any gamer, gambler, developer or someone with a huge chunk of many here – is, of course, the ability to make money. But do not get excited too early, first I need to tell you the specifics of this whiskered market. And our previous breeding knowledge will help us with that. The game started with 100 “Founder” and “Gen0” kitties. 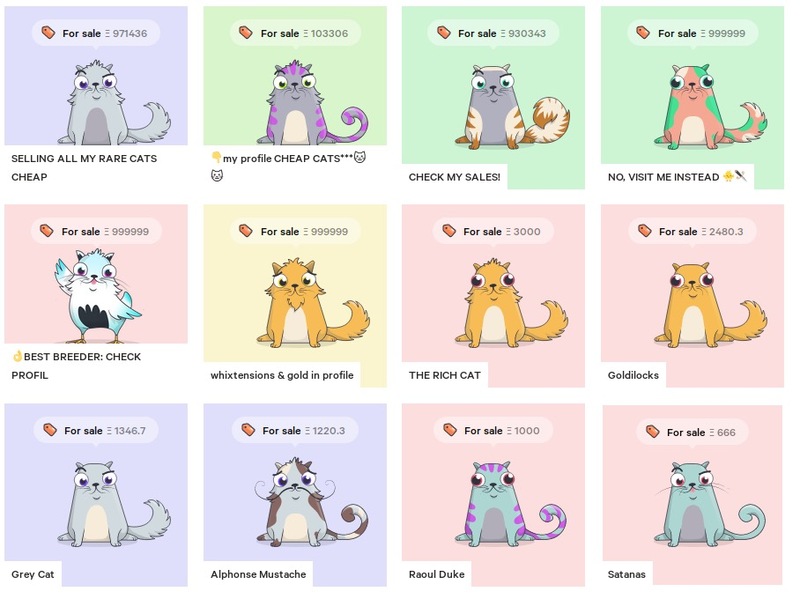 Founders were distributed among the very first participants, when Gen0’s (new kitten was releasing every 15 minutes) were selling at an average arithmetic price of last 5 kitties, multiplied by 1,5 and obeyed the Dutch auction rules. Currently, you can only buy your little buddy from a free market since all Gen0 kitties were already out. From the initial selling and distributing mechanisms as well as breeding concept, you can easily understand that each later generation breed becomes cheaper and cheaper since it only distances from the initial “golden” set. Putting it simply – more numbers your kitty’s GA code has – less valuable it becomes. CryptoKitties in that sense works like a classic pyramid – either get to the top or forget about respectable incomes. It may seem like we are pessimistic about the whole thing, pointing at the weak spots, but this won’t be very accurate. We just like to remind anyone, who raised interest in this game, and decided to become a professional kitty breeder – don’t put all eggs in one basket. Even individuals that made some good money on this platform, already express the opinions that they do not want to have that much money invested in CryptoKitties. Try to find a good deal on a Gen0 cat, or make a unique offer with your own pet – those are the best ways to earn fast on the system, otherwise be smart with your finances and remember that CryptoKitties are not cryptocurrencies. Undoubtedly, the breakout success of CryptoKitties will draw even more investors to the Blockchain gaming field. Already we can see around a dozen of similar games on the market, starting from buying your own celebrity card (where the real celebrity even gets a small share from the deal) to having your own digital Alpaca Farm. But without a joke, variety does not end here – check out, for example, this blockchain card game and this betting resource. I have faith that in the near future we will see even more options that rising blockchain developers can offer to the entertainment field. After all, what if I want to breed a puppy?